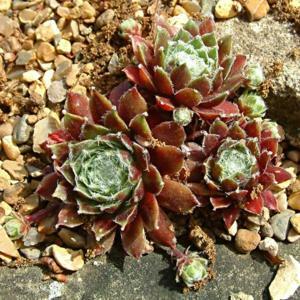 Medium sized rosettes of brownish-red flushed, green leaves, with silvery "cobweb" hairs at the tips and edges. Pink flowers. Hybrid of S. arachnoides x S. tectorm, introduced by Georg Arends, Germany, about 1929.